Derrick Krantz understands that Dana White may be in attendance to scout someone else, but he still plans on stealing the show. Derrick Krantz is only 31 years old but Friday night will be his 34th professional MMA fight. As a soon to be fellow 31 year old I can assure you that 31 is not old at all in the grand scheme of life, but fighting is a bit different. Krantz talked about finally realizing just how long he has been doing this. Krantz has fought some of the biggest names in the sport. A laundry list of UFC and Bellator fighters. This wasn’t by mistake and is something Krantz has always been proud of. Listen to the full interview to hear Krantz talk about having Dana in the crowd, more stories about his career, and what his thoughts are on his opponent Justin Patterson. 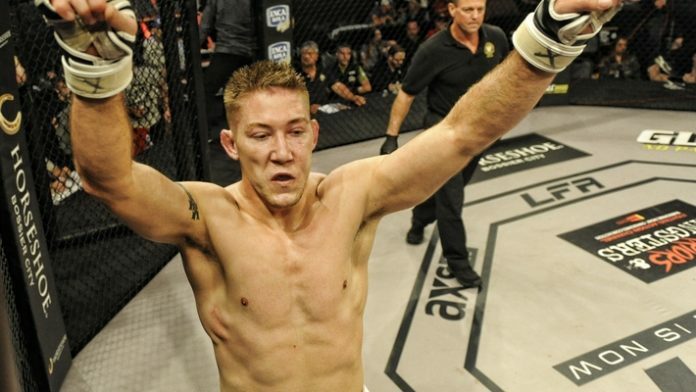 Derrick Krantz fights Justin Patterson at LFA 63 in Belton, TX Friday night LIVE on AXS TV. With Dana White in attendance the card is sure to be filled with surprises. Stick with MMANews.com for the latest.